Mali Political Crossroads: War and Transition? Burkina Political Crossroads: A Post-Compaoré Transition? Regional Political Crossroads: Contagion or Containment? Despite apparent marginalization from the global economy, Burkina Faso and Mali represent two pivotal West African states that attract considerable Canadian mining foreign direct investment (FDI). They are “canaries in the gold mine,” providing important signals about three complex, interdependent global challenges: environmental vulnerability, state fragility, and resource nationalism. As land-locked Sahelian states, these two ex-French colonies face tremendous challenges to overcome their ranking among the globe’s poorest 25 economies. The March 2012 coup in Mali surprised many observers, particularly as an election was barely one month away. But the coup alerted outsiders to the regional fall-out from the 2011 Libya intervention. Northern Mali was effectively occupied by Islamists and Tuareg separatists from late-March 2012. The April 2012 elections were postponed, but the transitional civilian government that took over from the coup instigators recently announced that elections will now go ahead in July 2013. Regional and international planning was underway for an African-led military campaign to retake the north, a campaign plan that required considerable international logistics support. However, a thrust into central Mali by Islamist forces on 10 January, 2013 led to a rapid French intervention before a coordinated African force could deploy. Within three weeks French, Malian, and other African military forces drove the Islamists from the key northern cities of Gao, Timbukto, and Kidal. However, a lasting political solution that incorporates non-radicalized Tuaregs is still required, and the post-coup transition in Bamako perhaps opens the door to a rejuvenated and inclusive Mali political system that could provide a bulwark against Islamist resurgence in the north. Burkina Faso pledged troops to the Mali effort just as it faced parliamentary and local elections in early December. President Blaise Compaoré has held office since assassinating his one-time revolutionary colleague Col. Thomas Sankara in 1987. Compaoré made the transition from military ruler to elected president, but has kept his grip on power through electoral manipulation and patronage. Burkina’s political malaise and Mali’s existential crisis mark a critical juncture for West Africa. How these two countries, along with regional and international partners (including Canada), manage their political-military challenges and resource nationalism impulses will have long-term domestic, regional, and international implications. Nestled at the land-locked crossroads of historic trans-Saharan trade routes and ancient empires, neighbours Mali and Burkina Faso (until 1984, Upper Volta) seem at first glance too isolated and insignificant to the world economy to rate serious attention. Both countries still rank amongst the world's poorest. Timbuktu, the northern Mali cultural and religious centre, remains a synonym for remoteness. 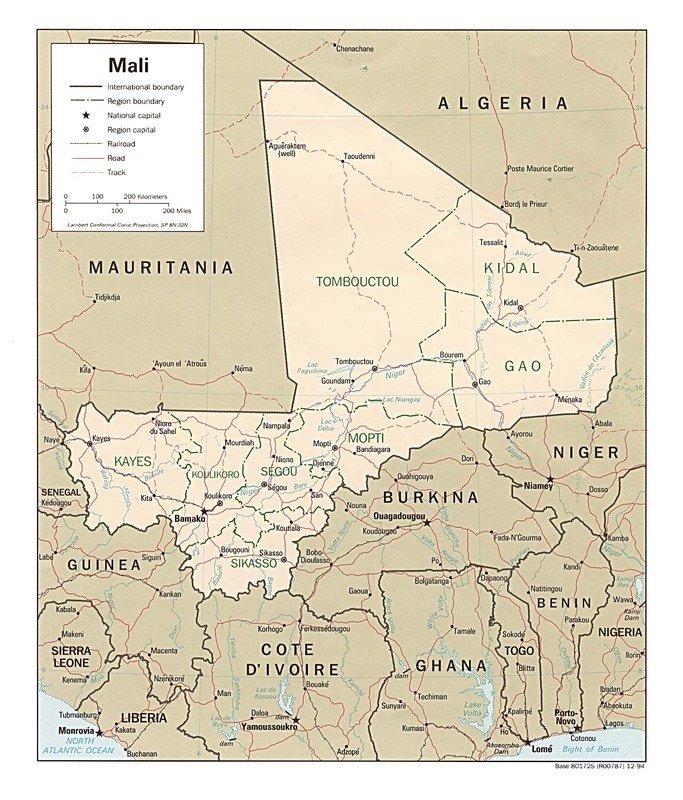 Mali is Africa’s eighth largest country by land area (1,240,192km2) and second largest country in West Africa, while Burkina Faso is the continent’s 28th largest (274,000km2). These two countries share many characteristics. Burkina has about 17 million people and Mali 16 million. Fertility rates are amongst the highest in the world. Both remain largely rural with the majority of the population engaged in agriculture. Both are also secular, Muslim majority states, although 40% of Burkinabe are non-Muslims, roughly split between Christian and traditional beliefs. French is the official language for these ex-French colonies but various African languages are more widely spoken – Bambara is the lingua franca in southern Mali, while Mande languages are common in Burkina – with some ethnic groups found on both sides of a once arbitrary colonial border. They share a regional currency, the CFA franc, which is pegged to the Euro. They are both members of ECOWAS (Economic Community of West African States, or, en français, la Communauté economique des Etats de l’Afrique de l’Ouest (CEDEAO)). They endure a Sahelian geography: concentrated water resources, large expanses of uncultivable land, and porous borders. Mali has over 7,000km of land borders with its seven neighbours, longer than that shared between Canada and the lower 48 states. "Canaries in the Gold Mine"
These mineral rich West African states, however, represent significant destinations for Canadian and other Foreign Direct Investment (FDI) in the mining sector. Mali in particular is also a significant and long-standing recipient of Canadian Official Development Assistance (ODA). Together they are important “canaries in the gold mine” that provide crucial signals concerning three interdependent global challenges beyond Mali’s immediate crisis. First, these Sahelian states face intrinsic geographical and environmental challenges. Water scarcity and periodic severe drought (including this year) create conditions for food and livelihood insecurity particularly as the majority of the population remains tied to the land and rivers via subsistence or cash-crop farming, herding, and fishing. Second, as the crisis in northern Mali illustrates (more below), the convergence of geography and lingering poverty creates political and security challenges for fragile states. Where Mali appeared to have an entrenched democratic political system, the March 2012 coup by disgruntled soldiers exposed the frailty of electoral politics in a poor country experiencing serious military setbacks. A direct result of political failure to support an over-stretched army, the coup was largely precipitated by a crisis caused by an international failure to recognize the regional fall-out of a post-Gadhafi Libya. Mali’s crisis is yet another warning sign about institutional weakness, porous borders, and fragility of poor aid recipient electoral democracies. It also signals the requirement for international vigilance around the interconnectedness of regional crises (including arms trafficking, the drug trade, and global terrorism) that cannot be neatly disentangled from a narrow focus on development assistance. Third, the role of extractive industries in the economic development of African states plays out strongly in Burkina Faso and Mali. After nearly twenty years of liberalized regulatory environments, the promises of mining for economic growth and poverty reduction have not matched the rhetoric. Mining was oversold as a development panacea by international financial institutions (IFIs) such as the World Bank, International Finance Corporation (IFC), and the Multilateral Insurance Guarantee Agency (MIGA). Mining is a capital intensive, not labour intensive, industry with few opportunities to develop upstream, downstream, and sidestream integrative linkages within weaker host economies. Resource nationalism can spring out of growing misalignment between the expected, often over-hyped, economic benefits and resource rents from mineral exploitation and the actual benefits, as well as occasional negative impacts on host communities. But in many cases domestic political and institutional failure to capture and accountably invest mining royalties and taxes, and to regulate effectively, drives populist attitudes towards increased resource nationalism. These three themes should be kept in mind during the following analysis of the political, economic, and security crossroads that confront these two West African states. News from Bamako about a military coup on 21-22 March, 2012 shocked both the continent and the global community. Historically no stranger to military coups and authoritarian rule, Mali had not experienced an unconstitutional change of government since 1991. That coup, however, ousted an unpopular autocrat and led to democratic reform and subsequent elections in 1992. After four 5-year election cycles, Mali was considered to be an established electoral democracy. Its economy attracted considerable mining investment over those two decades as it emerged as Africa’s third largest gold producer (roughly tied with Tanzania, behind only South Africa and Ghana). President Amadou Toumani Touré (popularly known as ATT), the military man behind the 1991 coup and widely credited with putting the Army firmly back in the barracks, was on the verge of stepping down after his second elected term (2002-2012). Elections were only a month away. As political confusion reigned in Bamako after the coup, a coalition of disparate northern rebels, separatists, and mainly Algerian, al-Qaeda linked Islamists (AQIM) took advantage and pushed south. Within days, half of Mali was more or less lost, under the sway of well-armed groups. One Tuareg-dominated faction, the National Movement for the Liberation of Azawad (MNLA), declared independence on 6 April 2012. The mostly bloodless coup, led by US-trained Captain Amadou Haya Sanogo, amounted to a frustrated lashing out by an overstretched military that faced the most organized Tuareg rebellion since independence. Political elite indifference to the northern crisis, and the concomitant severe lack of material support for the Malian Army, drew the “men on horseback” back into the political arena. This time they did not stay long, as a transitional civilian government took over in April after ATT formally resigned. But Captain Sanogo remains a political player in Bamako, with notable public and military support, and he receives all the perks of a former head of state. The Malian armed forces are more politicized than they have been in two decades, which delayed their ability to spearhead any northern campaign. Across Mali’s south-eastern border with Burkina Faso, President Blaise Compaoré, in power since he overthrew and murdered his one-time colleague Thomas Sankara in 1987, faced his own test at the polls in early December 2012. While his presidential term does not expire until 2015, his party, the Congrès pour la Démocratie et le Progrès (CDP), lost its stranglehold in the National Assembly but did not lose its legislative majority. When he barely weathered serious military mutinies and public protests in early 2011, Burkina seemed ripe for abrupt leadership change, much more so than Mali. But Compaoré held on by strategically doling out money and food, firing his prime minister and senior military chiefs, and arresting or firing hundreds of soldiers and police. A Consultative Council on Political Reforms was set up to investigate and recommend various reform proposals, including the creation of a Senate and formal recognition of traditional leaders. Regionally, he’s tried to position himself as an indispensible statesman, and he can usually count on strong French support. France’s January rapid military intervention in Mali was in part facilitated by pre-existing deployments in Burkina. Compaoré acts as the ECOWAS mediator between the Mali government and some northern rebel groups, and occasionally a hostage interlocutor with AQIM. But there are constant questions about his own manipulation of regional crises, affiliations with regional rebel and criminal groups, and his extended family’s tremendous wealth accumulated during his twenty-five years in power. Compaoré is one of Africa’s longest serving leaders due to the benefits of incumbency, patronage politics, party proliferation and, at times, electoral manipulation. The crisis in northern Mali only hit global radar screens after the March 2012 coup, but the “northern problem” has persisted since independence. Many Tuaregs resented their inclusion within French demarcated boundaries of what became the Republic of Mali and never accepted Bamako’s authority. Rebellions and violent response, followed by negotiated settlements, became a staple of Malian politics since the 1960s. This time, however, the rebellion was particularly well armed and internationalized due mostly to the collapse of Gadhafi’s regime. Besides the secular MNLA and jihadist AQIM, two new players emerged: the Islamist Tuareg faction Ansar Dine and an AQIM offshoot with broader West African aspirations, the Mouvement pour l’unicité et le jihad en Afrique de l’Ouest (MUJAO). When hostilities were launched mid-January 2012, dispersed and undersupplied army garrisons in the north were overwhelmed. Some Tuareg officers and troops reportedly defected to the opposition. Public protests against political inaction occurred in Bamako. Confidence in political leadership crumbled. Elements of the army struck (though it still is not clear if an army mutiny escalated into a coup or the coup was planned). Before the coup, Mali’s political elite were preoccupied by the upcoming April presidential and legislative elections under the terms of the 1992 constitution. But despite its twenty year electoral track record, Mali’s political system could not be described as particularly healthy or responsive to the needs of ordinary Malians. Modelled on the French semi-presidential pattern (i.e., a directly elected president who shares power with a prime minister drawn from a legislative majority), it included a carefully negotiated electoral system designed to produce legislative majorities. Overtly regional and ethnically-based parties were banned. An initial threat of single party dominance in the 1990s under President Alpha Konaré’s party, ADEMA (Alliance pour la Démocratie en Mali), swung towards party breakdown and proliferation during the 2000s given ATT’s independent status and consensus-building approach. Wide agreement over the years on the need to revise the electoral system never translated into action, and elite complaints about institutional legitimacy undermined public confidence in the entire political system. By the time of the coup, 128 of 147 members of the National Assembly formed part of a loose governing coalition including five major parties and independents. There was limited overt opposition and legislative oversight deteriorated. ATT’s policy of consensus devolved into a politics of mutual benefaction. The four main presidential candidates to replace ATT were all establishment figures who served under or supported him. ATT’s personal popularity had largely melted away before the coup. Despite considerable international support, ATT seemed slow to move against AQIM for years and perhaps used them as a counterweight to divert Tuareg attention. During ATT’s tenure corruption increased, furthering the divide between political elites and ordinary Malians. Logistical support for Army operations in the north was reportedly hampered by corruption or incompetence in the upper echelons of political and military leadership; frustrated field grade officers and NCOs led the coup, not colonels and generals. And a badly implemented initiative to promote security and development in the north – funded by the European Union, Canada, and others – may have triggered, or at least expedited, the remobilization of Tuaregs under the MNLA banner in 2011. Since April 2012, Mali has been run by a transitional civilian administration, but Captain Sanago and other military leaders remain powerbrokers. Interim President Dioncounda Traoré was the Speaker in the National Assembly as well as the presidential candidate for ADEMA-PASJ, and has been a target for pro-coup protestors unhappy with this old stalwart’s key role in the transition. The interim Prime Minister, Cheick Modibo Diarra (a political outsider who once worked at NASA and Microsoft), was forced by the putschists to resign on December 10th. He was replaced by Diango Cissoko, a consummate political insider who served in various governments since the 1980s and has IFI experience. Over the last year he served as Mali’s Ombudsman and just released his first annual report in November 2012. His appointment might signal a requirement for an experienced political administrator without political ambitions (Diarra apparently failed on both counts). Cissoko is attuned to the complexities of Mali’s elite politics and all the baggage that goes with it. But this latter qualification may not augur well for substantive political reform. Somehow, the post-coup and post-intervention consultations and transition have to accomplish three critical objectives to bring Mali back from the brink. First, the transitional period in Bamako must be used to push through stalled electoral, accountability, and decentralization reforms. This effort also provides a window for comprehensive approaches to the “northern problem.” Second, the Mali Army needs to be re-professionalized as well as reequipped and redeployed. They must earn the trust of all regions of the country, facilitating disarmament of regional militias. Third, international partners, including Canada, have to become tougher and more astute friends. Donors cannot walk away from some measure of responsibility for Mali’s precipitous slide towards the March coup. ODA kept flowing to an increasingly dysfunctional, hamstrung government. The same international coalition that helped to oust Gadhafi failed to recognize the regional consequences. Progress on all three objectives will be a tall order but not impossible. From one perspective, President Compaoré looks to be solidly in control out to 2015 and beyond. In recent legislative elections, his party retained its majority in the National Assembly. While that majority of national députés dropped to 55% from nearly 66% in 2007, his 70 CDP députés (of 127 seats in the National Assembly) plus 28 more for allied political parties provides a healthy cushion. In addition, the CDP won over 12,340 municipal conseillers seats (across 367 communes/ arrondissements and 18,645 total seats), an even healthier majority. Compaoré’s rich, generally discreet yet controversial younger brother, François, won a CDP seat in the National Assembly and could become the CDP presidential candidate in 2015. That is, if the senior Compaoré does not use his majority to change the constitution to undo term limits. The public grooming of François, long known as “le Petit Président,” and his rise in the CDP has caused friction within the party as well as public consternation. And the riots of 2011 remain fresh in the minds of many, their root causes hardly addressed. A brand new opposition party, Union pour le Progrès et le Changement (UPC), won 19 legislative and 1615 municipal seats, and is seen as a rising force in Burkina politics. Its leader, Zéphirin Diabré, will lead the opposition and position himself as a real alternative to the Compaoré brothers. He once served in Compaoré’s cabinet as Minister for Trade, Industry an Mining (1992-1994) and Finance Minister (1994-1996) during a critical period of economic restructuring. Subsequently he held senior international positions at the UNDP (1999-2005) and the giant French nuclear firm AREVA (2006-2010). If Diabré can mobilize a fractured opposition and overcome his elite pedigree amongst ordinary Burkinabe, he seems to be the only potential candidate that could challenge the Compaorés in 2015. As an ex-mining minister and industry player, Diabré may have the most nuanced understanding about how to balance investment attraction with host country benefits. The legacy of President Sankara (1983-1987), however, remains a latent political force. Sankara’s vision of an incorruptible, socialist people’s republic retains a certain appeal even if the formal political incarnation of the movement generates limited support. In fact, the December 2012 legislative election propelled the UPC past the l’Union pour la Renaissance/Parti Sankariste (UNIR/PS) as the lead opposition party. But Sankariste parties and student groups cannot be discounted as future beneficiaries of discontent. The next three years will be tumultuous ones in Burkina politics. As mentioned, both Burkina Faso and Mali still rank among the world’s poorest in terms of per capita income and human development. Each has a nominal GDP between US$10-11 billion, below that of Namibia and its two million people. The vast majority are involved directly in agricultural pursuits or the informal sector, with only 10-20% of the labour force involved in formal services (including government) or industrial sectors. Only 30% of the population over 15 are literate, and nearly half of the population is under 15. Many Burkinabe migrate to neighbouring countries (particularly Côte d’Ivoire and Ghana) for seasonal employment, while many Malians also work in the region or abroad. Remittances play a significant role in both economies. Both countries have an external debt of just over US$2 billion and rely on ODA for around 12% of Gross National Income. This translates to nearly 50% dependence on ODA for government expenditure in Mali. One significant difference is population distribution. In Mali the bulk of the population reside in the south, mostly in or near Bamako and along the Niger River, while the vast north and parts of the south west are sparsely populated. Burkina Faso’s population is much more evenly distributed and its overall ratio of cultivatable land is higher. As with many other African countries, these two also share a post-colonial economic dalliance with centralized economic direction. Bureaucracies and state-owned enterprises (SOEs) swelled from the 1960s. Under Sankara, Burkina experienced a particularly radical economic experiment with laudable aims but disastrous implications for human and political rights and entrepreneurship. From the 1980s, both Mali and Burkina implemented a far-reaching series of Structural Adjustment Programs that attracted IFI loans in return for difficult cuts to public spending, subsidies, and civil service payrolls while liberalizing markets and privatizing many SOEs. Recently, both countries have made some progress towards improving their overall business regulatory environments. Gold mining exploration and production drives overall economic growth: since 2000 Burkina Faso averaged 5.6% annual GDP growth and Mali 7.0%. Burkina is projected to average near 7% growth between 2012 and 2017, but given its current crisis Mali’s projections have dropped. Mining and telecommunications drove FDI growth in both countries over the last decade. Before gold mining, the biggest foreign exchange earner for both was cotton, a sector hit hard over the years by competition from synthetics, subsidies in other countries, price variability, and crop failures. Other agricultural commodities include rice, millet, mangoes, various nuts, vegetables, and livestock (cattle, sheep, and goats). Burkina’s top five exports in 2010 were gold (by a wide margin), cotton, vegetables, prepared food and tobacco, and livestock. Mali’s top five exports in 2010 were gold (by an even wider margin), cotton, livestock, fertilizer, and vegetables. Despite the ongoing crisis, a plan to establish a world class gold refinery in Mali was recently announced. The US$58 million project near Bamako will have capacity, by 2014, to process over 100 metric tons of gold per year from Mali and elsewhere to the highest London Bullion Market Association standard. This investment illustrates confidence that the current crisis will not significantly impact Mali’s gold production, and also gives mining firms the option of local refining, a hedge against resource nationalism. Unfortunately, gold mining alone cannot drive employment and wider industrial development. Its singular rise has much to do with broader infrastructure limitations. Despite decades of ODA totalling billions of dollars and an upsurge of mining FDI, infrastructure development and maintenance remain a major challenge to economic expansion and broadly-based growth. The surge in gold mining versus exploitation of other available minerals is attributable to high-value, easy to export gold versus the low-value, high-volume output of base metals or industrial minerals. Regional rail links are very limited, roads are inconsistent, and even the mighty Niger River is only navigable, in part, at certain times of the year. Transportation costs thus remain high and “are compounded by and very sensitive to any inefficiency in the transit chain [including]… customs administration, cross-border waiting times, and logistics costs.” Potential interruptions related to regional political instability (i.e., from banditry to terrorism) are additional complications. Mali’s section of the ECOWAS regional road network is in better condition than Burkina’s, and provides access to ports at Tema (Ghana), Dakar (Senegal), and Abidjan (Côte d’Ivoire). Burkina can access these ports as well as Lome (Togo) and Cotonou (Benin), and its location makes it an inland transit hub for ECOWAS transportation corridors. Energy costs are also a significant constraint and reflect the transport costs of fuel, all of which is imported. Electricity tariffs in Burkina and Mali are among the highest in Africa, and even then these tariffs do not come close to covering the actual costs of production (up to $0.40 kWh). This cost structure limits residential access and industrial expansion and costs Burkina up to $50 million/year in subsidies. Compare that to public grid prices in landlocked Zambia ($0.04-06 kWh) that facilitate an expanding copper sector. Solar power is an obvious, untapped alternative. Small scale residential and industrial solutions are making headway, and medium scale projects have recently been announced. But the majority still rely on wood, charcoal, and kerosene for their daily household energy needs. Telecommunications is an emerging infrastructure success story. By 2011, Burkina boasted over 7.2 million active mobile phone subscriptions across three network operators (a fourth license is in the works), up from just 633,000 in 2005. Mali jumped from 761,000 subscriptions in 2005 to nearly 11 million by 2011, with only two operators (a third operator was licensed in 2012). Broadband and overall internet access lag far behind, but Mali does have broadband mobile services and Burkina’s operators will upgrade their networks soon. Increased access to fibre optic cable versus reliance on satellite will drive down internet prices and expand options. But radio remains the dominant form of mass communication. It is no exaggeration to say that without aggressive Canadian-listed junior mining firms going global in the early 1990s, neither Burkina nor Mali would have a significant gold mining sector today, or hope for more broad-based mineral exploitation in the future (see Appendix A – Canadian-Listed Mining FDI in Burkina and Mali). Most of the early exploration and project development was undertaken by small Canadian-listed firms, alongside Australian and South African firms. This is not to say that Canadian miners dominate the industry, but they are vitally important players, and this is particularly true in Burkina. Established Canadian miners such as Iamgold (market cap was over $4 billion but has recently fallen to $3.1 billion partly in response to the Mali crisis) started out as tiny private juniors exploring prospective areas in Mali, a country just opening up to foreign investment in the late 1980s. Twenty years ago industrial scale gold mining in these countries was non-existent. Attractive mining codes, including low royalty rates and tax holidays, were designed to stimulate investment in mining across much of liberalizing Africa from the early 1990s. Mali and Burkina, along with Tanzania in the east, led the pack. What many policy-makers and critics today forget is how difficult it was to attract mining investment in a world of stagnant commodity prices and well-established, low risk jurisdictions in the early 1990s. Until the short boom in speculative mining investment triggered by the BRE-X gold “discovery” in Indonesia in 1995 (proved fraudulent in March 1997), and long before China’s commodity appetite drove up prices in the mid-2000s, internationally-oriented junior mining firms struggled to finance their exploration and development activities. Exciting geology was not enough given frontier mining jurisdictions with no track record and poor infrastructure. Comprehensive assessments involving all “above-ground” risks, from political stability and security to fiscal, monetary, regulatory, infrastructure, business climate, and environmental and social criteria, can quickly rule out project development. Even if Mali’s current crisis is not yet significantly impacting its concentration of gold mines in the south, any projects in the north will be difficult to develop for the foreseeable future and non-gold properties will face bigger hurdles. Northern and eastern Burkina, which hosts some operating mines and exploration projects, is exposed to potential cross-border raids by AQIM, MUJAO, and well-armed criminal opportunists (see Appendix B – Gold Mines and Prospects in Burkina and Mali). For instance, the long running saga to develop the world-class Tambao manganese deposit in northeast Burkina faces not only infrastructure but also increased insecurity challenges. An additional risk element faced by mining firms throughout Africa is an increasing tide of resource nationalism intended to enhance the domestic benefits of mineral extraction. Established jurisdictions including South Africa, Ghana, and Zambia and emerging ones including Tanzania, Mali, and Burkina have re-examined and revised their mining codes recently. While the nationalization option is restricted to extreme cases (e.g., Zimbabwe), other mining code revisions can significantly impact fiscal and legal terms, and thus risk assessment, for existing and future projects. Governments seek higher mineral rents and greater local impact (e.g., processing, promotion of indigenous capabilities, employment, community infrastructure, etc.). Unfortunately, the pendulum often swings too far and threatens investment at a time when exploration financing is difficult and project development costs continue to rise. Mali’s revisions were introduced just weeks before the coup and have taken effect as of June 2012. While they amount to an update and are not as sweeping as other jurisdictions, they enhance the ability of the state to force companies to undertake more local processing and beneficiation, establish formal requirements for Community Development Plans, increase environmental and mine closure planning and financial commitments, and allow for more regular fee reviews for mining titles and surface rights. The flat 3% royalty rate may be changed, while other tax burdens are streamlined. Burkina’s proposed revisions are similar in many respects, and include greater potential role for state carried interest and new tax rates for the transfer of mining titles. Taken together, both revisions change the risk calculations for mining projects, which generally have a long lead-in and life-cycle. The implications of these changes could be reduced new exploration investment and delayed project development, depending on how some of the yet unknown regulations and discretionary criteria eventually work themselves out in practice. And political and security uncertainty in both jurisdictions means that permanent regulatory frameworks that facilitate long-term planning may be some time off. Strategies to reduce the threat of resource nationalism include transparency in dealings with national governments and local communities (e.g., both countries are signatories to the Extractive Industries Transparency Initiative, although only Mali is a full member), enhanced local job creation and local contracting, environmental diligence, and inclusive and well articulated community development initiatives (not simply an aggressive public relations strategy). Gadhafi’s demise in 2011 unleashed thousands of well-equipped, non-Libyan fighters south across the Sahara. This tipped an already precarious security situation facing both Burkina Faso and Mali. ATT had taken a less activist approach to AQIM infiltration in the north than his Algerian and Mauritanian neighbours, and American and French supporters, expected. Criminal activity expanded. For many years both countries contributed to various African and UN peace operations missions: hundreds of West African soldiers have taken courses at the L’Ecole de Maintien de la Paix Alioune Blondin Beye in Bamako. US Africa Command has run counter-terrorism courses with the Malian Army, as have the French in both countries and Canada to a lesser extent. But peace operations abroad and a narrow focus on counter-terrorism did not prepare, nor equip, the Mali Army for the well-armed rebel surge it faced in January 2012. Until recently, the overall personal and property security situation across much of Burkina Faso and the southern half of Mali remained manageable and quite good by West African standards. The Burkina capital of Ouagadougou was one of the safest cities in the region in terms of personal security, as long as troops and police were not rioting in the streets. However, in outlying and border areas the security situation across Burkina has declined since at least 2010, including banditry on some highways and the threat of AQIM incursions in the north. 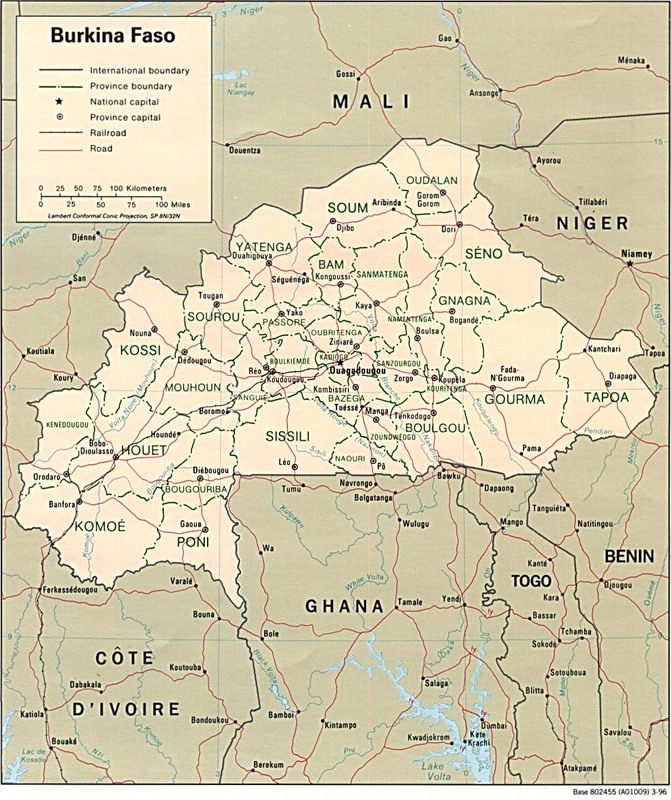 Violent ethnic clashes in the south along the border with Côte d'Ivoire and along the border with Mali have escalated. The series of Burkinabe riots and army mutinies of early 2011, spawned by economic hardship not ideology, could easily re-ignite given the right combination of economic pressures and political missteps. Labour strife or student protests could again trigger wider demonstrations. Political demonstrations in Bamako have become more common and, at times, violent. Protests against and in support of the putschists will only increase as political transition negotiations intensify. Hundreds of thousands of internally displaced Malians will also demand more government support. Those left in northern Mali faced a particularly difficult period, as AQIM, Ansar Dine, and MUJAO instituted draconian interpretations of Sharia law. As Malians flow back to the north after the liberation of key cities, lack of services and rebuilding local security and governance structures may generate political friction. Regional small arms proliferation means that not only rebels and terrorists are better equipped, but so are criminals and rival political factions. And in November 2012 the threat of kidnapping expanded into Mali’s south west mining region as MUJAO took a French national and whisked him north. How promptly and effectively Malian and other African security forces establish themselves in the north to deter any Islamist return will determine how far the insecurity net reaches into Mali and, increasingly, Burkina. In early November 2012, fully eight months after the northern half of Mali fell under the loose control of various rebel and terrorist groups, ECOWAS met in Abuja, Nigeria to hammer out a coordinated military response (a Concept of Operations). Nigeria, Burkina Faso, and other members committed over 3,000 troops to work with the Mali Army to launch a military campaign in the north. The plan required extensive international logistic support and financing. Detailed ECOWAS planning in terms of leadership, communications/language issues, and even weather related factors, however, seemed lacking from the start. The UN Security Council unanimously asked ECOWAS to submit such a plan, but its quality and feasibility was called into question by both UN and American officials. Debates continued in the UN and between potential international supporters, and finally on 20 December 2012 the Security Council unanimously passed Resolution 2085, a Chapter VII mandate for an African-led force to “take all necessary measures” to recover the north. Mali itself remained an obstacle, as political struggles in Bamako sent mixed signals about how much ECOWAS and international troops would be welcome, and how capable the Mali Army would be of spearheading military operations. ECOWAS had not yet deployed any troops when an Islamist push in central Mali on 10 January, 2013 brought an urgent appeal by the interim Mali government to France to intervene, which they did with airstrikes and rapid deployment of army units into the country. Other countries remained reticent, prepared to support the French and African contributions through logistics support and training. Using a combination of air strikes, Special Forces, parachute drops, airmobile infantry, and light armoured columns, between 11-30 January 2013 French-led formations advanced on and recaptured Konna, Diably, Gao, Timbukto, and Kidal. As in most desert warfare, logistics and mobility were the keys to success in the northern campaign. After some initial hard fighting in Konna and Diably, Islamist forces melted away as their heavy weapons and vehicles were destroyed by French air strikes. The scale of the Islamist conventional military threat may have been over-estimated: AQIM and MUJAO have a core of committed fighters but rely on hired help, and both MNLA and Ansar Dine have political objectives. Fighting between those various groups since mid-2012 also shows that cleavages in the north can be leveraged, and as the situation worsened for Ansar Dine a faction split off with a renewed call for negotiations. The rapid success of an ad hoc but French-led campaign is, however, just the first step to reconfiguring a more secure Mali and Sahel. A large African military force in the north, effective political reforms in Bamako, and astute international support for both are still required to ameliorate (though likely not end) the threat of extremist resurgence or terrorist acts. Is northern Mali the next Afghanistan? Will the entire country become a failed state? An autonomous or lawless northern Mali controlled by any combination of AQIM, Ansar Dine, and MUJAO would become a permanent magnet for other jihadists, a persistent threat for Mali and its neighbours. Northern Mali is a short flight to Europe and a staging area for trade in illicit drugs, arms, conflict diamonds and minerals, and human trafficking. But there are short-term political, military, and economic actions that can contain and ultimately reverse the current crisis at much less cost in blood and treasure than Afghanistan requires on a continuing basis. The direct military threat is considerably smaller, neighbouring states are mostly on the same page, and, most importantly, the local population in Timbuktu, Gao, Menaka, Kidal and other northern centres do not ascribe to a puritanical, Salafist interpretation of Islam, nor are they mostly separatists. Even nomadic Tuaregs are divided: some accept the Malian state (particularly if given more local autonomy and input), some desire a separate yet secular state, and a few radicalized elements – by conviction or convenience – aspire to either an Islamic Republic of Mali or a greater Islamic caliphate from the Atlantic to northern Nigeria. Positions are not set in stone and often reflect clan cleavages and responses to bad government policy. As recent reports indicate, Ansar Dine is apparently open to political negotiations (or at least elements are, as illustrated by factional splits), as is the MNLA. But if Ansar Dine demands an extreme form of Sharia law be maintained in a more autonomous north, neither Bamako, nor a majority of northerners, would acquiesce. The ability of AQIM, Ansar Dine, and MUJAO to procure, and in many cases compel, support from jobless northerners, youth, and foreigners enabled them gradually to overwhelm and marginalize the secular MNLA from June 2012. Poverty, lack of education and alternative opportunities, and disenchantment with or estrangement from an out-of-touch “southern” government provides a fertile ground for true-believers to mobilize the disaffected or bored. Kidnapping ransoms and involvement in the drug trade generated tremendous resources to buy weapons and pay higher salaries than otherwise available. And the fall of Gadhafi increased the availability of arms and fighters across the Sahel. A critical juncture of events came together in late 2011 that pushed an already fragile polity over the edge. Considering a complex mix of political, economic, demographic, and environmental pressures faced by both countries, three scenarios can be forecast. It is prudent to prepare for the worst case, but work towards the best. The worst-case scenario sees a half-hearted, delayed, and ultimately unsuccessful international effort to consolidate the successes of the French-led northern liberation, increasing local and regional instability. International attention wanes, even if money flows in, adversely impacting the important logistical tail needed to support Malian and ECOWAS troops on operations 1000+ km north of Bamako as well as containment operations along the borders with Burkina, Niger, Algeria, and Mauritania. No serious attention is paid to the deeper political issue of including Tuaregs in the ongoing process of Malian political renewal, and separatist and radicalized movements grow. Violence and ethnic retribution replace talk of political reform. The failure emboldens international jihadists from as far away as Somalia. Boko Haram’s violence across northern Nigeria increases as it enhances linkages to regional and international extremist networks in West Africa. Personal and property security degenerates in both countries, including in areas previously considered outside the extremist area of operations. Between heightened efforts at internal security and increasing financial, refugee, and economic pressures on both governments, any hope for either deepening political responsiveness or stimulating broad-based economic growth fall away. Mali ultimately loses its ability to transition back to a democratic trajectory and the military stays engaged in politics. Compaoré plays the national security card to retain international support and forestall political change. The regional crisis becomes permanently militarized but only half-heartedly engaged. The most hopeful scenario involves effective security consolidation after the short and sharp military campaign that dislodged and diminished the most extreme Islamist elements, alongside a comprehensive political settlement that accommodates the aspirations of a sufficient number of Tuaregs in a revitalized Malian constitutional framework. Elections are eventually held and attract over 50% of eligible voters. The Mali Army is drawn out of politics and back into the field, with better equipment, logistics, with domestic political and international support. Through better lines of accountability, responsibility, and transparency (promoted to a large degree by international partners), politicians and civil servants break old patterns and use public funds more wisely. Education and infrastructure receive top priority, facilitating gradual economic expansion. In Burkina, President Compaore does not try to amend the constitution and does not lead the CDP into competitive 2015 elections (though he may still end up in a new senate). Pressure by opposition parties, students, merchants, farmers, media, and donors curtail the worst excesses of incumbency. Investment in infrastructure picks up which helps mining and agricultural sectors. In both countries mining projects beyond gold become viable. Mining code amendments are done in consultation and not by fiat, although friction is never completely avoidable. (Overall likelihood: 20%). The bottom line in terms of investment risk versus opportunity is that these two countries will remain relatively high risk in the short term, but the medium-to-long term outlook for mining or other investment in either country remains an open question. Thus, how these fragile states, and their international partners including Canada, manage these three complex challenges – the Sahelian environment, institutional weakness and military crisis, and resource nationalism – will have significant implications for the stability, attractiveness, and prosperity of these two states and the entire region. Cultivating resilient states is neither easy nor cheap, but it is imperative. Chris W. J. Roberts, BA, MSS, is President of African Access Consulting (established 1995) and a PhD candidate in political science at the University of Alberta. Chris has worked in the field of Canada-Africa business development, policy, and risk assessment for over fifteen years, and was a founding director and later Vice President-Western Canada for the Canadian Council on Africa (2002-2009). He is a graduate of the University of Calgary’s Centre for Military and Strategic Studies, and since 1994 he’s visited fifteen different countries in Africa and has recently returned to West Africa. He has written widely in business and policy outlets in Canada, including Embassy, Vanguard, and The Rising Africa, and has started to submit to academic publications. The views expressed in this article are the author’s alone, but he is grateful for input from a number of keen West African observers, including Belko Ousmane Diallo, Nina Müller, Joshua Olusegun Bolarinwa, Sharkdam Wapmuk, Dr. Remi Aiyede, Erameh Nicholas Idris, Dr. Rasheed Akinyemi, Dr. Ferdinand Ottoh, Dr. Ademola Adeleke, and a CDFAI anonymous reviewer. NOTE: This report was originally completed on 14 December 2012 and has been updated to reflect the momentous events of the last six weeks. Burkina ranked 18th (US$600) and Mali 22nd (US$669) poorest countries in the world based on statistics and rankings from the World Bank online database of indicators, ordered from lowest to highest (GDP per capita, 2011): http://data.worldbank.org/indicator, accessed 10 December 2012. In the UNDP’s 2011 Human Development Index, Mali ranked 175th out of 187 countries, while Burkina ranked 181st: http://hdr.undp.org/en/statistics accessed 10 December 2012. Figures from the World Bank online database of country data (Population, 2011): http://data.worldbank.org/country, accessed 10 December 2012. Both countries contain a rich diversity of ethnic groups and associated languages. Only 27% of Burkinabe and 35% of Malians live in urban areas: http://data.worldbank.org/indicator/SP.URB.TOTL.IN.ZS, accessed 10 December 2012. There are two different CFA francs covering West (XOF) and Central (XAF) Africa, but they are both fixed at the rate of 656 CFA francs = 1 Euro. Prior to the creation of the Euro, the CFA franc was pegged to the French franc. More details below, but cumulative assets of Canadian-listed FDI in mining in these two countries totalled over $2.1 billion as of 2011. A surprisingly comprehensive and well-documented Wikipedia page provides extensive details about “Canada-Mali relations”: http://en.wikipedia.org/wiki/Canada%E2%80%93Mali_relations, accessed 10 December 2012. While Mali is a CIDA priority country, Burkina was cut from the priority list in 2009 although it still receives Canadian ODA. Philipp Heinrigs, Security Implications of Climate Change in the Sahel Region: Policy considerations (Paris: OECD Sahel and West Africa Club, 2010): http://www.oecd.org/swac/publications/47234320.pdf, accessed 10 December 2012. The Sahel is generally delineated as that area in Africa that lies between 12 and 20 degrees north latitude, “and covers all or part of 12 countries from the Atlantic coast to the Red Sea: Mauritania, Senegal, The Gambia, Mali, Burkina Faso, Niger, Nigeria, Chad, Sudan, Ethiopia, Eritrea, and Djibouti.” Ibid., p. 5. A UN Integrated Regional Strategy for the Sahel is in the works. See “UN officials urge support for integrated strategy to tackle crisis in the Africa’s Sahel region,” UN News Centre (10 December 2012): http://www.un.org/apps/news/story.asp? Chris W. J. Roberts, “Not just another coup in Mali,” Embassy (28 March 2012): http://www.embassynews.ca/opinion/2012/03/28/not-just-another-coup-in-mali/41410, entire article is only available to subscribers. See Chapter 8, “Optimizing Mineral-based Linkages,” Minerals and Africa’s Development: The International Study Group Report on Africa’s Mineral Regimes (Addis Ababa; Economic Commission for Africa/African Union, 2011): http://www.africaminingvision.org/amv_resources/AMV/ISG%20Report_eng.pdf, accessed 10 December 2012. Annie Chikwanha, “Resource Nationalism in Africa and Beyond,” Africa Portal (27 November 2012): http://www.africaportal.org/articles/2012/11/27/resource-nationalism-africa-and-beyond, accessed 10 December 2012. See, for example, “African Union suspends Mali over military coup,” France24 (23 March 2012): http://www.france24.com/en/20120323-african-union-suspends-mali-over-military-coup-ecowas-summit, accessed 10 December 2012; and, William G. Moseley, “Mali’s coup must be widely condemned,” Al Jazeera Online (23 March 2012): http://www.aljazeera.com/indepth/opinion/2012/03/20123238341314250.html , accessed 10 December 2012. Ironically, the Freedom House 2012 report (based on 2011 data) rated Mali as “Free” in terms of political rights and civil liberties, one of only nine Sub-Saharan African countries in that category. A summary is available on the African Elections Database: http://africanelections.tripod.com/fh2012.html, accessed 10 December 2012. “Mali Tuareg rebels’ call on independence rejected,” BBC News Africa Online (6 April 2012): http://www.bbc.co.uk/news/world-africa-17640223, accessed 10 December 2012. Patrick Smith, ed., “Sanogo ponders compromise,” Africa Confidential, Vol. 53, No. 12 (8 June 2012), p. 9. The firing of the transitional prime minister by Sanogo is further evidence of his clout: Célia d’Almeda, “Chieck Modibo Diarra a jetté l’éponge” Journal du Mali (11 December 2012): http://www.journaldumali.com/article.php?aid=5634, accessed 11 December 2012. An unsuccessful counter-coup attempt by the elite 33eme Regiment des Commandos Parachutistes (ATT’s Presidential Guard) at the end of April 2012 further divided the Mali Army, and reportedly led to atrocities committed on captured paratroopers: David Pugliese, National Post (26 January 2013): http://news.nationalpost.com/2013/01/26/paratroopers-trained-in-canada-led-counter-coup-in-mali-but-presidential-guard-unit-failed-to-regain-control, accessed 30 January 2013. Annette Theron, “The 2011 protests in Burkina Faso: Indicators of more conflict to come,” Consultancy Africa Intelligence (16 May 2011): http://www.consultancyafrica.com/index.php?option=com_content&view=article&id=758:the-2011-protests-in-burkina-faso-indicators-of-more-conflict-to-come-&catid=60:conflict-terrorism-discussion-papers&Itemid=265, accessed 10 December 2012. A good synopsis is found on the US State Department website: http://www.state.gov/r/pa/ei/bgn/2834.htm, accessed 10 December 2012. A series of constitutional amendments were passed prior to the December 2012 election which included the recommendations to establish a Senate, seen as a way for Compaoré to ease his way out of the president’s office but to remain politically relevant. “Au Burkina Faso, l’armée française se fait discrète,” Jeune Afrique (16 May 2012) : http://www.jeuneafrique.com/Article/JA2678p036-037.xml1/france-libye-defense-ouagadougouau-burkina-faso-l-armee-francaise-se-fait-discrete.html, accessed 30 January 2013. For example, Compaoré may have played some role in helping to free Canadian diplomats Robert Fowler and Louis Guay from AQIM in 2009 (in addition to the role played by ATT). Colin Freeman, “Meet President Compaore of Burkina Faso – the man who could help solve Africa’s al-Qaeda crisis,” The Telegraph (17 November 2012): http://www.telegraph.co.uk/news/worldnews/africaandindianocean/mali/9680574/Meet-President-Blaise-Compaore-of-Burkina-Faso-the-man-who-could-help-solve-Africas-al-Qaeda-crisis.html, accessed 10 December 2012. Patrick Smith, ed., “To catch a thief,” Africa Confidential, Vol. 50, No. 22 (6 November 2009), p. 4; Peter Dörrie, “Burkina Faso: Blaise Compaoré and the Politics of Personal Enrichment,” African Arguments (15 August 2012): http://africanarguments.org/2012/08/15/burkina-faso-blaise-compaore-and-the-politics-of-personal-enrichment-by-peter-dorrie, accessed 10 December 2012. In other words, the northern crisis is far from a straightforward Tuareg revolt. See Andrew Lebovich, “Northern Mali: the Politics of Ethnicity and Locality,” Think Africa Press (7 December 2012): http://thinkafricapress.com/mali/politics-ethnicity-locality-mali-mujao, accessed 10 December 2012. Election turn-out of eligible voters in Mali is dismally low. Since 1992 no Presidential or National Assembly vote reached 40% turn-out, and most elections are decided by 30% or less of eligible voters even when the polls are not boycotted by opposition parties: http://africanelections.tripod.com/ml.html, accessed 10 December 2012. The President is directly elected (with a run-off if necessary), and 147 seats in the National Assembly are elected in a two-round majoritarian system across 55 multi-member constituencies. If no single party receives 50% plus one of the vote in a constituency, a run-off is held two weeks later between the top two parties and the winner gets ALL the seats for that constituency. This can produce larger leverage (% of votes into seats) than Canada’s simple first-past-the-post electoral system. But the system is complicated to administer and weakens as parties proliferate and factionalize, and this is what has occurred in Mali. See Leonardo A. Villalon and Abdourahane Idrissa, “The Tribulations of a Successful Transition: Institutional Dynamics and Elite Rivalry in Mali,” Chapter 3 in Leonardo A. Villalon and Peter VonDeopp, eds., The Fate of Africa’s Democratic Experiments: Elites and Institutions (Indiana University Press, 2005). James Wan, “Mali’s 2012 President Elections: Consolidation We Can Believe In,” Think Africa Press (21 February 2012): http://thinkafricapress.com/mali/2012-president-elections-consolidation-we-can-believe, accessed 10 December 2012. Questions about competency and corruption of the ATT administration were hardly recent. See, for instance, US diplomatic cables prior to his 2007 re-election: http://www.cablegatesearch.net/cable.php?id=06BAMAKO1237, accessed 10 December 2012.
 International Crisis Group, “Mali: Avoiding Escalation,” Africa Report No. 189 (18 July 2012): http://www.crisisgroup.org/~/media/Files/africa/west-africa/mali/189-mali-avoiding-escalation-english, accessed 10 December 2012. See particularly pp. 5-7. The creation of rival militias in the north is a long established tradition. What has been identified as institutionalized “tolerated derogations” from official military budgeting processes over the years provide increasing opportunities for (mis)use of funds outside legislative or auditing oversight. Anatole Ayissi and Nouhoum Sangaré, “Mali,” Chapter 6 in Wuyi Omitoogun and Eboe Hutchful, eds., Budgeting for the Military Sector in Africa: The Processes and Mechanisms of Control (Oxford University Press/SIPRI, 2006), pp. 131-135. A synopsis is available here: http://www.eeas.europa.eu/delegations/mali/documents/projects/paix_et_securite_fr.pdf; details and criticisms of the initiative are outlined in the ICG report on Mali cited above, pp. 6-8. “Mali President Traore beaten up by protestors,” BBC News Online (21 May 2012): http://www.bbc.co.uk/news/world-africa-18142488, accessed 10 December 2012. “Analysis: Premier’s ouster complicates Mali crisis,” UN-IRIN (12 December 2012): http://www.irinnews.org/Report/97030/Analysis-Premier-s-ouster-complicates-Mali-crisis?, accessed 12 December 2012. Biography here: http://www.maliweb.net/news/politique/2012/12/11/article,111240.html, accessed 12 December 2012. “Elections couplées du 02 décembre : Le CDP satisfait de son score” Lefaso.net (11 December 2012): www.lefaso.net/IMG/pdf/Municipale_National.pdf, accessed 11 December 2012. See also the official election results at http://www.ceni.bf. The election was generally thought to be free and fair, with a relatively high turn-out. However, results for the critical 9 seat constituency that includes the capital were delayed and the UPC claims it has evidence of manipulation of the results. Burkina uses a complicated multi-member, proportional representation system to elect both députés and conseillers, and over 70 political parties ran in one or more national constituencies (provinces). Remi Carayol, “Burkina Faso : François, l’autre Compaoré, Jeune Afrique (18 July 2012): http://www.jeuneafrique.com/Article/JA2687p038-041.xml0, accessed 10 December 2012. As the lines of the new government formed in January 2013, François Compaoré did not end up either in cabinet or as President of the National Assembly, surprising some observers. This and reforms passed by a joint committee might illustrate the constraining power of both allied and opposition parties on the CDP. See Fulbert Paré, “Assemblée nationale: La 5e Législature adopte son Règlement à l’unanimité,” lefaso.net (21 January 2013) : http://www.lefaso.net/spip.php?article52366, accessed 30 January 2013. “Mali: ‘We Cannot Live Under the Law of Strangers’,” IRIN (3 October 2012): http://allafrica.com/stories/201210041209.html, accessed 10 December 2012. A useful introduction to the recent spate of coups in West Africa, and their different results, is Olinta Lopez, “New Millennium Coups in West Africa,” United Explanations (1 May 2012): http://unitedexplanations.org/english/2012/05/01/new-millennium-coups-in-west-africa accessed 10 December 2012. Ed Vulliamy, “How a tiny West African country became the world’s first narco state,” The Guardian (9 March 2008): http://www.guardian.co.uk/world/2008/mar/09/drugstrade, accessed 10 December 2012; David O’Regan, “Narco-States: Africa’s Next Menace,” The New York Times (12 March 2012): http://www.nytimes.com/2012/03/13/opinion/narco-states-africas-next-menace.html?_r=0, accessed 10 December 2012. Classified US diplomatic cables released by Wikileaks reveal a strange incident in November 2009 involving a Boeing 727 that was destroyed in northern Mali. It was suspected to be transporting cocaine from Venezuela, and Malian aviation and drug investigators were reportedly delayed 3-4 weeks before Malian security services (DGSE) let them access the site: http://www.guardian.co.uk/world/us-embassy-cables-documents/246478, accessed 10 December 2012. Christophe Boisbouvier and Pascal Airault, “ Gbagbo à tout prix,” Jeune Afrique (No. 2703-2704, 28 octobre au 10 novembre, 2012), pp. 38-41. For a complete list of the 2012 ratings, based on 2011 data, see the Freedom House report, “Table of Independent Countries,” Freedom in the World 2012: The Arab Uprisings and their Global Repercussions: http://www.freedomhouse.org/sites/default/files/inline_images/Table%20of%20Independent%20Countries%2C%20FIW%202012%20draft.pdf, accessed 10 December 2012. Emman Ovuakporie, “Reps release guidelines for constitution review,” Vanguard (28 October 2012): http://www.vanguardngr.com/2012/10/reps-release-guidelines-for-constitution-review, accessed 10 December 2012. Damilola Oyedele, “Minister Defends Nigeria, ECOWAS’ Intervention in Mali,” This Day Live (8 November 2012): http://www.thisdaylive.com/articles/minister-defends-nigeria-ecowas-intervention-in-mali/130016 accessed 10 December 2012. Patrick Smith, ed., “Boko Haram looks to Mali,” Africa Confidential, Vol 53, No 24 (30 November 2012), pp. 4-5. World Bank Data Indicators (GDP, current US$, 2011): http://data.worldbank.org/indicator/NY.GDP.MKTP.CD, accessed 10 December 2012. On a Purchasing Power Parity basis, GDP rises to the $17-18 billion range. World Bank Data Indicators (Total external debt, 2010): http://data.worldbank.org/indicator/DT.DOD.DECT.CD/countries (note that both countries have already qualified for debt relief under the Heavily Indebted Poor Countries initiative); (Net ODA received, %, 2011): http://data.worldbank.org/indicator/DT.ODA.ODAT.GN.ZS/countries, accessed 10 December 2012. Jonathan Glennie, “Can Mali be weaned off aid?”, The Guardian (17 February 2011): http://www.guardian.co.uk/global-development/poverty-matters/2011/feb/17/mali-end-aid-dependence, accessed 10 December 2012. It is impossible to go into detail about Sankara’s political and economic programme, its implementation, and results, but the objectives and modalities of Sankara’s revolution remain a nostalgic legacy drawn on by some opposition movements in Burkina and even elsewhere in West Africa. A good, recent overview is Peter Dörrie, “25 Years On: The Mixed Legacy of Burkina Faso’s Thomas Sankara, Socialist Soldier,” Think Africa Press (15 October 2012): http://thinkafricapress.com/burkina-faso/mixed-legacy-thomas-sankara-socialist-soldier-25-year-anniversary, accessed 10 December 2012. One recent report comparing sixteen West and Central Africa countries puts Burkina and Mali on top in terms of progress towards improving regulations and processes for small and medium enterprises. See “Doing Business in OHADA 2012,” (25 January 2012): http://www.doingbusiness.org/reports/regional-reports/ohada, accessed 10 December 2012. Average taken of 13 years (2000-2012, GDP, constant prices, reported and estimated), from IMF World Economic Outlook Database: http://www.imf.org/external/pubs/ft/weo/2012/02/weodata/index.aspx, accessed 10 December 2012. Burkina Faso: http://www.indexmundi.com/trade/exports/?country=bf; Mali: http://www.indexmundi.com/trade/exports/?country=ml, accessed 10 December 2012. “PAMBC and SBC Group AG sign the protocol agreement to create the first gold refinery in Mali,” Mining Online (no date, but after 21 September 2012): http://www.mining-mali.com/pambc-and-sbc-group-ag-sign-the-protocol-agreement-to-create-the-first-gold-refinery-in-mali-press-release, accessed 10 December 2012. See Cecilia M. Briceno-Garmendia et al, “Burkina Faso’s Infrastructure: A Continental Perspective,” (May 2011) and “Mali’s Infrastructure: A Continental Perspective,” (June 2011), Africa Infrastructure Country Diagnostic Country Reports: http://www.infrastructureafrica.org/system/files/Burkina%20Faso%20ctry%20rpt%20Web.pdf; http://www.infrastructureafrica.org/system/files/Mali%20country%20report.pdf, accessed 10 December 2012. Ibid., “Burkina Faso’s Infrastructure,” p. 11. Ibid, “Burkina Faso’s Infrastructure,” p.28, 31; “Mali’s Infrastructure,” p. 28. Imported electricity is much cheaper for Burkina but supply is limited due to shortages elsewhere, grid limitations, and inefficiencies. Mali’s grid does not fully reach into the south eastern cotton region nor fully into the south west mining area, and only recently established regional interconnection with Côte d’Ivoire. UKAid/World Bank, “What would it take for Zambia’s Copper Mining Industry to Achieve its Potential,” (July 2011): http://siteresources.worldbank.org/INTZAMBIA/Resources/copper-mining-summary-note(online-copy).pdf. The report points out that Zambia still suffers periodic power shortages and cannot keep up to demand, which suggests that Burkina and Mali still have a very long way to go to attract significant non-gold mining and industrial projects. The European Union recently announced support for a 22MW photovoltaic power plant in the outskirts of Ouagadougou (14 November 2012): http://europa.eu/rapid/press-release_IP-12-1204_en.htm, accessed 10 December 2012. Renewables are a major focus in Mali: http://www.afdb.org/fileadmin/uploads/afdb/Documents/Project-and-Operations/RE%20Mali%20exec%20summary%20final.pdf, accessed 10 December 2012. Resources/282822-1346223280837/datavisualization.pdf. See also a recent Deloitte report: http://www.gsma.com/publicpolicy/wp-content/uploads/2012/03/SSA_FullReport_v6.1_clean.pdf, accessed 10 December 2012. Table 1: Internet access in Africa in “The mobile’s virtuous cycle,” African Business (November 2012), p. 57. See also “Continued mobile growth in Burkina Faso as fixed broadband lags,” OAfrica (29 September 2012): http://www.oafrica.com/statistics/continued-mobile-growth-in-burkina-faso-as-fixed-broadband-lags, accessed 10 December 2012. James M. Otto, “The Competitive Position of Countries Seeking Exploration and Development Investment,” Chapter 6 in Wealth Creation in the Minerals Industry: Integrating Science, Business, and Education (Society of Economic Geologists, 2006), p. 117. Otto delineates nine risk assessment criteria, of which only the first is “Geologic criteria”. Political opportunism and infrastructure challenges have hindered the development of this project since 1993. The current concession holder, Pan African Minerals Limited, is affiliated to African Minerals Limited, a firm that now exports iron ore to China from Sierra Leone. That project was impressive for the level of infrastructure put in place to mine and move the ore. The Burkina project, however, is a far greater logistical and infrastructure challenge, but the potential of Chinese partners may allow the project to proceed once security and political risks become manageable. “Amendments to the Malian Mining Code,” Norton Rose Global (September 2012): http://www.nortonrose.com/knowledge/publications/70668/amendments-to-the-malian-mining-code, accessed 10 December 2012. Boris Martor, “Burkina Faso Mining Code: amendments in sight,” Lexology (29 October 2012): http://www.lexology.com/library/detail.aspx?g=ce74e390-271d-454b-850f-0d50f4232cf3, accessed 10 December 2012. “Mining firms at risk, Islamist groups spread to Burkina Faso,” Exclusive Analysis (5 October 2012): http://www.exclusive-analysis.com/reports/burkinafaso5october.pdf, accessed 10 December 2012. “Mali group claims kidnapping of Frenchman,” Al Jazeera (22 November 2012): http://www.aljazeera.com/news/africa/2012/11/20121122162637394879.html, accessed 10 December 2012. “ECOWAS adopt harmonised deployment of forces in Mali,” Sweet Crude Reports (12 November 2012): http://sweetcrudereports.com/2012/11/12/ecowas-adopt-harmonised-deployment-of-forces-in-mali, accessed 10 December 2012. The ECOWAS plan had been under development since at least September 2012. From a series of private conversations in Lagos, November 2012. Craig Whitlock, “Pentagon planning for multinational military operation in Mali,” Washington Post (5 December 2012): http://www.washingtonpost.com/world/national-security/pentagon-planning-for-multinational-military-operation-in-mali/2012/12/05/7916ab86-3f0c-11e2-b9a1-7ad17c5c7b86_story.html, accessed 10 December 2012. All the relevant, recent UN documents for Mali and the Sahel can be found here: http://www.securitycouncilreport.org/un-documents/malisahel. Adam Nossiter and Eric Schmitt, “France Battling Islamists in Mali,” The New York Times (11 January 2013): http://www.nytimes.com/2013/01/12/world/africa/mali-islamist-rebels-france.html?ref=mali, accessed 30 January 2013. “French capture Kidal, 3rd and last major Mali town held by radical Islamists,” The Washinton Post (30 January 2013): http://www.washingtonpost.com/world/africa/french-troops-control-key-airport-in-last-north-mali-city-that-was-held-by-islamist-rebels/2013/01/30/fa34b502-6ab6-11e2-9a0b-db931670f35d_story.html#, accessed 30 January 2013. Lydia Polgreen, “Faction Splits from Islamist Group in Northern Mali,” The New York Times (24 January 2013): http://www.nytimes.com/2013/01/25/world/africa/faction-splits-from-islamist-group-in-northern-mali.html, accessed 30 January 2013. John Thorne, “Will Mali be Africa’s Afghanistan?”, The Christian Science Monitor (27 November 2012): http://www.csmonitor.com/World/Africa/2012/1127/Will-Mali-be-Africa-s-Afghanistan, accessed 10 December 2012. Just one example of the foreign, cultural-religious impositions of the extremists in northern Mali is the attack on a globally influential northern Mali music scene. See Sudarsan Raghavan, “In northern Mali, music silenced as Islamists drive out artists,” The Washington Post (30 November 2012): http://www.washingtonpost.com/world/in-northern-mali-music-silenced-as-islamists-drive-out-artists/2012/11/30/110ea016-300c-11e2-af17-67abba0676e2_story.html, accessed 10 December 2012. An excellent, short analytical piece written in the fall of 2011 outlines both the internal cleavages within the Tuareg and those between Bamako and the north that foster ongoing resentments and stimulated the creation of the MNLA: http://www.menas.co.uk/pubsamples/SF1104.pdf, accessed 10 December 2012.